In this second post in a series on mental ray for Maya 2016 Render Settings, we assume you are familiar with the concepts presented in the introductory post. Overall quality is the primary control for adjusting quality vs. speed. When there is noise in the scene, typically increase this quality. In our example scene below, we set Overall Quality to an extremely low 0.01. Please note the edge aliasing on the tops of the spiral cone object. The back wall also has a bump texture which has noise at this quality setting. In the following images we increase the overall quality from 0.2 to 1.0 by 0.4. 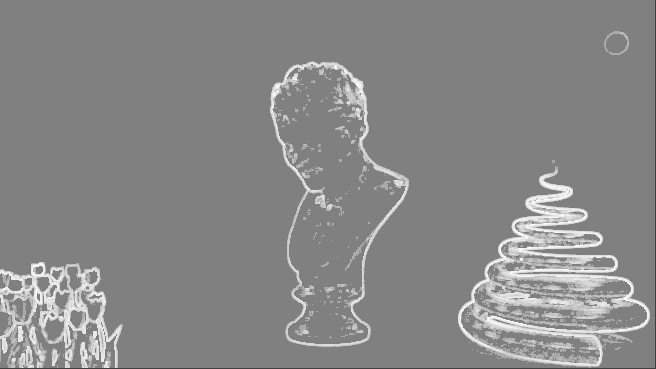 Note the better anti-aliasing at the edges of these objects, in particular. To visualize how eye ray samples were placed in the rendered image, from the Diagnostic tab check Diagnose Samples before rendering. With this checked, each render creates special informational passes for diagnostics including samples, error, and time per pixel. To view it, from the Render View File menu in Load Render Pass, choose the Diagnose samples pass. This will bring up an imf_disp window with the samples pass already tone-mapped to see the sample density in gray scale clearly. Note the green arrow above pointing out useful information in the bottom bar. Wherever you locate the cursor on the image, in this bar you will see the pixel location, [202 48], and the number of samples, 15 in this case. Here are a set of samples diagnostics to match the increasing quality from our scene above from 0.2 to 1.0. Whiter areas have more samples. Although Overall Quality can be used to handle most quality vs. speed adjustment, we can provide understanding how to get to desired results more efficiently. Understanding is important to prevent artists from quick fixes that turn out to take longer than originally planned. 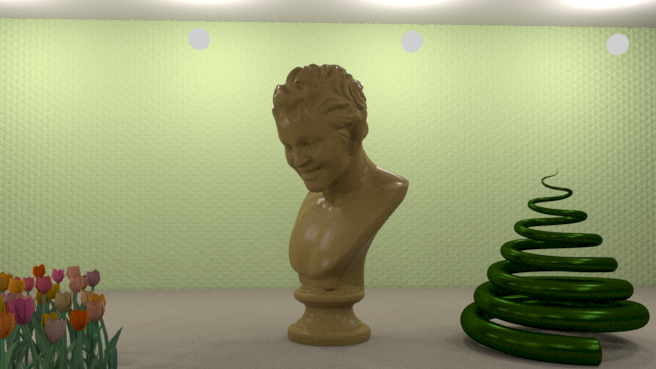 With that said, it is possible to balance the local vs. the global quality settings for faster renders. This balance will evolve as machine resources change and rendering technology adapts. For example, a brute force render running on GPU might rely solely on a global quality control, since pure path tracers do not split eye rays by design. However, current mental ray provides flexibility in how much you want to tip this balance one way or the other. It can evolve at your pace, and fit your CPU and GPU resources as they evolve. Use the local quality controls when there is an unbalanced amount of noise from lighting or from materials. For example, if the direct lighting appears to create more noise than other aspects of the scene, increase the lighting quality for optimum speed vs. quality tradeoff. Once adjusted, the overall quality can be used as the main control again. Consider lighting quality adjustment when the lighting has a large variation. For example, when using a large (> 40) number of lights, or several large area lights. Or when using a high resolution, highly varying HDR image for your light texture. For example, below we have one rectangular area light showing its HDR texture clearly as not uniform. Its range reaches up to values of 70 in a thin horizontal line in the middle of the thick one you see at this exposure. It required less light intensity as well as high lighting quality. Consider indirect diffuse or material quality adjustment when noise appears on indirectly lit diffuse or glossy surfaces. Or on surfaces with a lot of geometric detail. If you ever had to work with an ambient occlusion (AO) pass that needed more samples, you have a rough idea of the kind of look difference due to geometric variation. The surface details can come out a bit more clearly, with less noise. The Lighting Quality controls the number of direct light samples used, when a ray hits an object. It takes into account the number of lights, both point and area, and other factors to determine how many light samples to use. The scene used for our example has 14 area lights with sphere shapes. Note the quality of the direct lighting on the floor as we increase lighting quality. In this series, we keep Overall Quality at 0.25 and increase Lighting Quality from 0.2 to 1.0 by 0.4 steps. When using Lighting Quality in the new UI, mental ray overrides the explicit area light samples set in each area light with a global samples-per-light setting. (Currently, it does not gray out the samples settings in the area light AE UI). The total number of light samples are re-allocated based on importance. For example, more samples may be taken from closer, or higher intensity, lights. Tip: If you are having difficulty isolating the visual noise for adjusting direct lighting quality, use MILA light passes to help you see it. In the Scene tab, enable the direct diffuse pass and adjust to minimize noise in that pass, compared to other passes or the beauty itself. 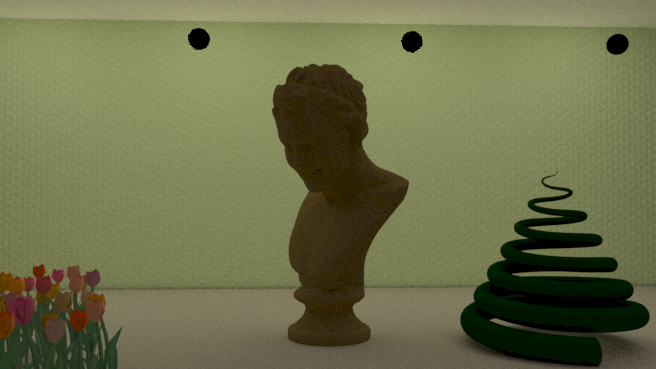 For example, the following images show the direct diffuse pass from the above renders, as Lighting Quality increases from 0.2 to 1.0 by 0.4 steps. We will show more detail about light passes in our upcoming post on light passes. Controls the number of environment light samples to use. Also using importance, it is separate from lighting quality and enabled when environment lighting is enabled. 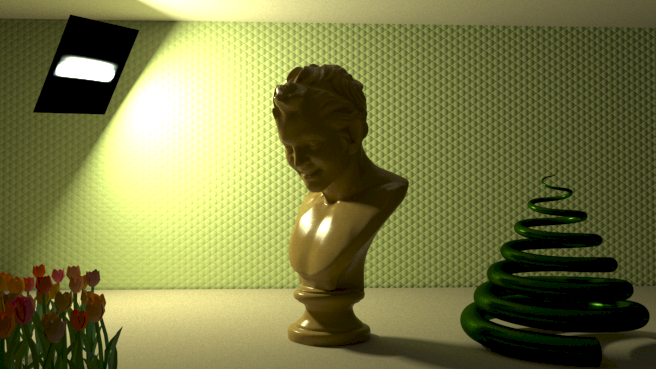 We will give examples of this in a later post in this series about environment lights. We encourage the selection of On (GI Prototype) mode, over Finalgathering and other legacy modes, for its reduced controls and higher quality. 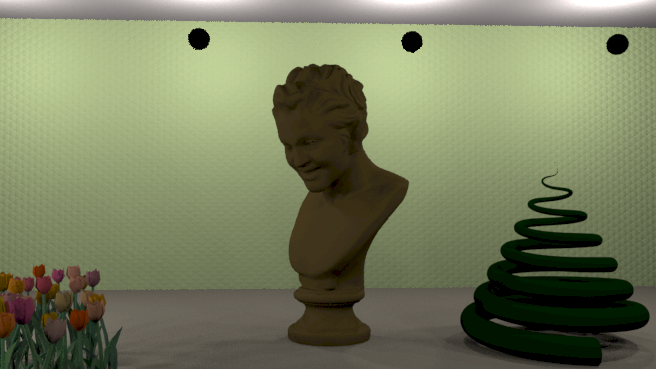 When On, mental ray uses a new technique to characterize arbitrary material shaders, while also providing non-interpolated brute force sampling paths for ease-of-use. The Indirect Diffuse Quality controls the number of samples split out for a diffuse interaction at a material. For the basic default Global Illumination (GI) mode of On, this controls the number of GI rays. In Finalgather (FG) mode, it controls the number of FG rays, as well as the FG point density and other FG controls. Below as Indirect Diffuse Quality is increased, note the noise on the floor where the light has to reach from reflections off the walls, ceiling and objects. To see it isolated as we did above with the direct diffuse pass, enable the indirect diffuse pass. The Trace Depth controls affect how deep an individual eye sample path can go. The Indirect Diffuse trace depth has moved into the general Trace Depth section. When an eye sample originates from the eye, each interaction along a given path increases the ray traced depth count. The interaction type can identify different types of counts. For example, a Diffuse reflection or transmission counts toward the Diffuse depth, while glossy or specular reflection counts toward Reflection, and glossy or specular transmission counts toward Refraction. Note: Currently, a Diffuse value of 0 means that the first indirect diffuse samples are taken, but then no others, when an indirect diffuse mode is enabled. In other words, the act of using an indirect diffuse mode automatically creates the first level in trace depth. However, this diffuse count starts after the first diffuse interaction, not at the eye. Compared to the rest of the depths, this means this number is one less in relative depth to the other interactions for a given eye sample. This matches legacy FG diffuse depth control. But this will be changed in the future to better match the other trace depth controls. Material Quality is discussed in more detail in the next post on recommended modern materials and lights. a simple question, how did you guys manage to emit so much light from a plane textured with a light source shape ? I assume you are talking about the one picture with the textured light shape in the upper left part of the image. 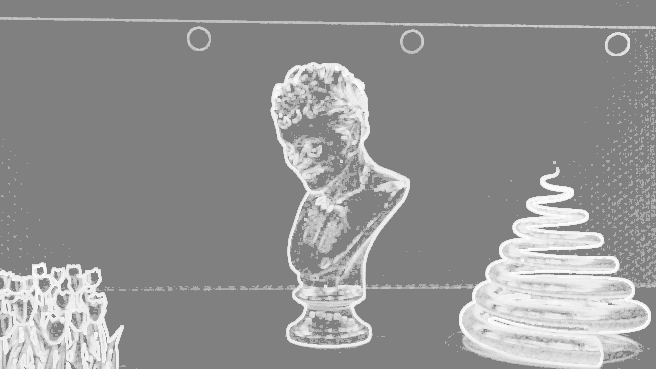 It uses the mental ray specific Physical Area Light, which can take a texture as input to the Color attribute, and also has an Intensity attribute, which multiplies by the Color. In this case, the texture is an exr that is so hot, we actually turned down the intensity well below 1.0. There will be a post dedicated to the Physical Areal Light soon. thanks for your answer, now that explains it. Keep up the good work and tutos !